In 2014, the US Geological Survey (USGS) and Esri announced the publication of the most detailed global ecological land units(ELUs) map in the world. The ELUs are terrestrial ecosystems defined and modeled as unique combinations of bioclimate, landform, geology, and land cover. In creating the original version, the team learned of the input data’s limitations and created a plan to improve the ELUs with updated input data in 2015. Today, Esri and USGS are pleased to announce the availability of an update to the global ecological land units (ELUs) map. In particular, Esri created a new global landforms layer to address valid criticisms of the earlier version, which under-represented hills and over represented plains. 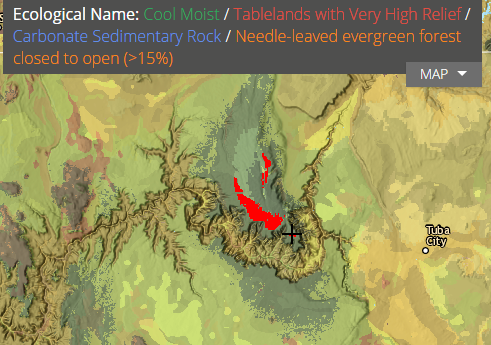 Additionally, the new landforms dataset gained more classes, including tablelands. The new dataset is also more regionalized, or less fragmented than the earlier dataset, and therefore more intuitive. Highlighted is a portion of the Kaibab Plateau on the north side of the Grand Canyon in the U.S. New landform classes such as tablelands were incorporated into the 2015 Ecological Land Units dataset. Click on the image to open the EcoExplorer App to learn more about Ecological Land Units where you live. Just prior to initial release of the ELUs in December 2014, The European Space Agency’s (ESA) Climate Change Initiative (CCI) released an improved land cover dataset. The land cover data used in the original ELU data was created using MERIS Satellite imagery from 2009. The improved data used an improved methodology and was divided into three epochal eras (2000, 2005, and 2010). We chose the most recent (2010), which like the new landforms layer is also available as a layer in the Living Atlas of the World. Using the two new inputs, and the original bioclimate and lithology inputs, we re-combined the layers to produce new version of the ELUs. This version contains 3,639 ELUs, as compared with the 3,923 ELUs produced from the original stratification. The new ELUs are richer in detail with increased levels of accuracy due to the improved landforms and land cover data. One question we’ve often heard is whether the new data can be used to find trends. That would be nice, but the changes are almost entirely the result of the dramatic improvements to the two updated source data. We encourage you to explore and use of the new ELU resource starting with the EcoTapestry app, which works in a web browser. The app features an updated ELU map and clicking that map will show the values of the underlying data, which can help you become familiar with how ELUs work to define ecosystems or at least the physical setting for ecosystems. We are always interested in and appreciative of your feedback, which can be provided here as comments or on GeoNet.